Mike Ginnitti of Spotrac.com breaks down what would happen if the Bills released a number of high-priced, high-profile players in 2018. This may be their only way to avoid “salary cap hell” in 2018. His $18.08M cap figure currently ranks 17th among signed 2018 QBs. If they plan is to move on the Bills will need to trade or release Taylor before the 3rd league day of 2018 when his $6M roster bonus fully guarantees. Prior to that the Bills will be on the hook for $8.64M in dead cap, a savings of $9.44M. His $9M cap figure ranks 6th among signed 2018 TEs. The Bills hold $9M in dead cap on Clay next year, which can be split into $4.5M in each of 2018/2019 if released or traded after June 1st. By doing the latter, the Bills can clear $4.5M in cap space for 2018. His $16.575M cap figure ranks 4th among 2018 DTs. The new Bills regime likely would’ve already parted ways with Dareus were his contract even a “little bit” flexible. It won’t get much better in 2018, where he represents $21.55M in total dead cap, including $7.35M of is salary. The only feasible way out appears to be a Post June 1st release, which leaves behind $13.75M in dead cap in 2018, and another $7.8M in 2019. The move would clear $2.825M for the Bills next year. His $14.45M cap figure ranks 3rd among signed 2018 LTs. The Bills may consider going younger and cheaper on their line in 2018, but will take a hit to do so. $1.5M of Glenn’s 2018 salary is already guaranteed, accounting for a total of $11.1M in dead cap to be released. They’ll need to do so by the 3rd league day to avoid another $6.5M in salary guarantee, with a $2M roster bonus to be paid just two days after that. His Pre-June 1st release would save the Bills $3.35M in 2018 cap. His $7.575M cap figure ranks 16th among signed 2018 Gs. 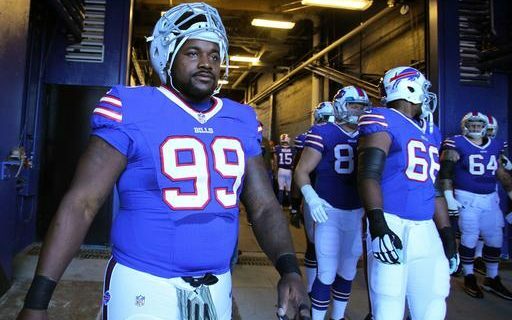 The veteran lineman has been excellent in his 2+ years in Buffalo, but represents a potential $6.325M in savings per his release next offseason. It’s a possibility. His $8.95M cap figure ranks 1st among signed 2018 RBs. Still one of the best backs in all of football, McCoy will hit the dreaded 30-year-old mark next season. Add in a big cap hit, and a team that may be in full rebuild mode, and the writing may be on the wall here. Trading or releasing McCoy before June 1st repesents $3.7M in savings for the Bills, while a Post-June 1st move would clear $6.325M. Estimated $57M in total cap space to work with based on a $168M league salary cap, but only 27 players under contract. For more contract information on the Bills, visit their salary cap page at Spotrac.com.